With Somfy myLink technology you can now easily control your window coverings, awnings, screens, and rolling shutters with a smartphone or tablet. This free app integrates with the Somfy-powered motorized solutions to allow easy management no matter where you are located in the world (with internet access). Want to automate your motorized applications on a weekly basis? At work and you forgot to close your window shades for the day? With a single tap of the myLink app, you can close all your shades which makes this easy-to-use solution one of our top window treatment trends for 2015. Somfy myLink now allows you to experience a high-end automation system, but at a fraction of the price. The major benefits of this technology include energy savings, privacy, comfort, and convenient controls for both residential and commercial applications. 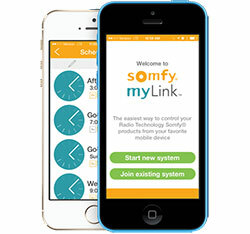 Watch this video to learn more about how easy it is to use the Somfy myLink system. This instructional video walks you through operation on an iPhone device, but the Somfy myLink app is available for both iOS and Android. The interface features five channels to control up to five individual motorized applications OR five groups of motorized applications with one myLink unit and your mobile device. This allows easy mix and match of motorized applications with ease as well as simple zone control throughout your home or office. If additional channels are needed it is scalable to use multiple myLinks together. Create an optimal and convenient living environment with effortless sunlight control so you can spend time doing what you enjoy most. This robust capability maximizes the benefits of the technology to work alongside your natural environment. The control plugs directly into any standard wall outlet and communicates over your home’s WiFi network for simple installation. You can then control directly from your phone or tablet (iPhone/iPod Touch/iPad & Android phones and tablets) anywhere you have internet access. The myLink dashboard was designed to be simple and intuitive while providing an at-a-glance view of all paired motorized products. You can see your next schedule, recently used scenes for quick access, and use the drag & drop interface for schedule creation. Upgrade to a convenient and relevant control option for Somfy-powered solutions by harnessing the power of your favorite mobile device (both iOS and Android). Even when away from home or office you can activate Somfy-powered applications with a single tap on-the-go. This can offer benefits such as extra privacy, UV protection, and energy savings. Set up scenes to schedule automated motorized applications on a seven day schedule. Effortlessly enjoy the convenience of a timed event with a single myLink which can support up to 25 times events. The installation and setup process is intuitively design so you can enjoy your myLink experience in just a few short minutes. Installation with 3 Blind Mice Window Coverings also includes operation training. Control all Radio Technology Somfy® RTS products including blinds, shades, curtains, screens, awnings, and rolling shutters as well as RTS enabled lighting devices. Somfy has been offering products with unsurpassed performance which reflect years of innovation and development. The result is a reputation for state-of-the art products that are simple to use, easy to install and are dedicated to providing full value and satisfaction to end users. Our commitment to this exceptional level of quality is demonstrated with our industry leading warranty of 5 years. Ask your installer for details. Since 1980 Somfy has been the leading manufacturer of controls for interior and exterior window coverings. 400+ engineers work to develop innovative products, backed by 450 active patents and 270 million users worldwide they are doing motorization right. Time for lunch? Effortlessly close all the motorized shades in your kitchen, extend your motorized awning, and in an instant be ready for a snack in the shade. While your interior stays cool you can enjoy the outdoors while resting under the automated awning. Start and end your day right with an automated shade scheduled to open at the time you are supposed to awaken. Use the warm and welcoming natural light rather than a rude alarm clock. You can then create a second schedule that will close your shades in the evening to provide privacy and peace of mind…oh the beauty of automation! Speak with one of our knowledgeable designers and find the best motorized window treatment options compatible with your home automation system. You can also stop by our showroom to view the large selection of window treatments in Southern California we install.